Come on out and help keep our stretch of Harrisburg Pike looking clean and attractive to drivers passing by! We will have scheduled clean-up days and times through the year, or you can go on your own! Zion hosts a community meal every Thursday evening at 5:30 PM. Open to all whether you’re in need of a good hot meal or just conversation you’re invited. A hearty meal of home cooked favorites await guests each week prepared by different groups from Zion and other churches and organizations. Would you like to prepare and serve a meal? Then please contact Joanne Grim at 898-2911. During and after our worship, we’ll be taking part in the ELCA “God’s Work, Our Hands” community service initiative. One service at 10 AM, with a picnic and service projects for all ages following. “God’s Work, Our Hands” T-shirts will also be available for purchase at $10.00 each. 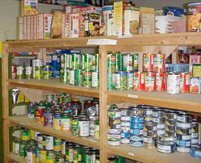 The Hempfield Area Food Pantry serves only those that live within the Hempfield School District. Families and individuals qualify to become clients by using the income guidelines of the Central PA Food Bank which is re-issued every June. Clients must provide valid photo ID with current address each visit. Clients may get food from the pantry once per week. Items vary from week to week. Clients are given a choice of food items they wish to receive. If your family does not like peas, you can choose another vegetable that you or your family will enjoy, so that food does not go to waste. In addition, we also will take consideration with our food distribution if you have special dietary needs. .
Joyful Noise Offerings benefit organizations including the Women’s Shelter, Holiday of Hope, Christ’s Home for Children, various disaster relief needs, families in need who live in the area, etc.